Kirby Vardeman has recently accepted God’s call to become the pastor at the new Mercy Tree Cowboy Fellowship, in Atkins, Arkansas. He, along with his wife of almost 20 years Michelle and their daughter Hillyn, will be working in conjunction with First Baptist Russellville and the Arkansas Baptist State Convention to begin this new work. 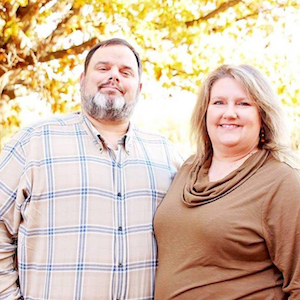 Kirby has been a Church planter and Pastor for 6 years, starting LifeStone Church in Russellville in 2009. Kirby’s son James continues to serve as a teacher and musician at LifeStone. Kirby is certified by the North American Mission board and the Arkansas State Convention as a Church Planting Missionary. Kirby Graduated from Arkansas Tech University Ozark Nursing Program in 1995. He received his BA in Hospital Administration from Almeda University in Boise, Idaho in 2001, and is currently attending Andersonville Theological Seminary in Andersonville, Georgia via the online campus, seeking his Masters in Theology. The Vardeman family is excited, and more than a little nervous, about this amazing opportunity to reach Atkins and the surrounding area through this new work. Please pray for them as they go forward. Because Kirby is leaving his full time job in order to dedicate more time to Mercy Tree Cowboy Fellowship, pray that the Lord would allow Kirby to find a part time job that would provide for his financial needs. Pray for Kirby's daughter, Hillyn as she has been having heart issues and will be undergoing further testing. Pray for people's hearts to be open in order to receive the Gospel. Construction team to put a roof over the bleachers at the arena they are currently using.